Found on a table at Sunset Beer Company in Echo Park. shouldn’t that be “what Gulliver’s travels” are? Monica, do you not know what Gulliver’s Travels is? at first I thought this was on a post-it, but a closer look on a better computer reveals that it’s on a napkin. Sancho knows a lot then. 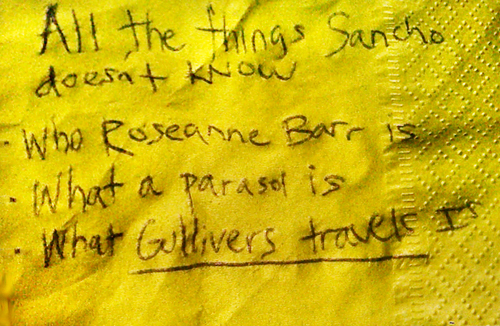 Sancho might find it useful to read Gulliver’s Travels; then he’ll be prepared with a parasol when he encounters Roseanne Barr in the street. Sancho doesn’t know these things as he’s trying to get his private island from Don Quixote.